Calculations at a frustum-pyramid, an object made of a regular frustum and a matching regular pyramid attached on the larger base. 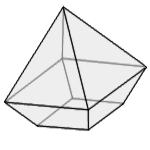 Enter the number of vertices at the base, the side lengths at the base and at the transition between frustum and pyramid, as well as two of the three heights. Choose the number of decimal places, then click Calculate.